Hepatitis D virus ribozyme complex. Computer model showing an RNA (ribonucleic acid) strand from an Hepatitis delta (Hepatitis D) virus genomic ribozyme, complexed with a ribonucleoprotein. 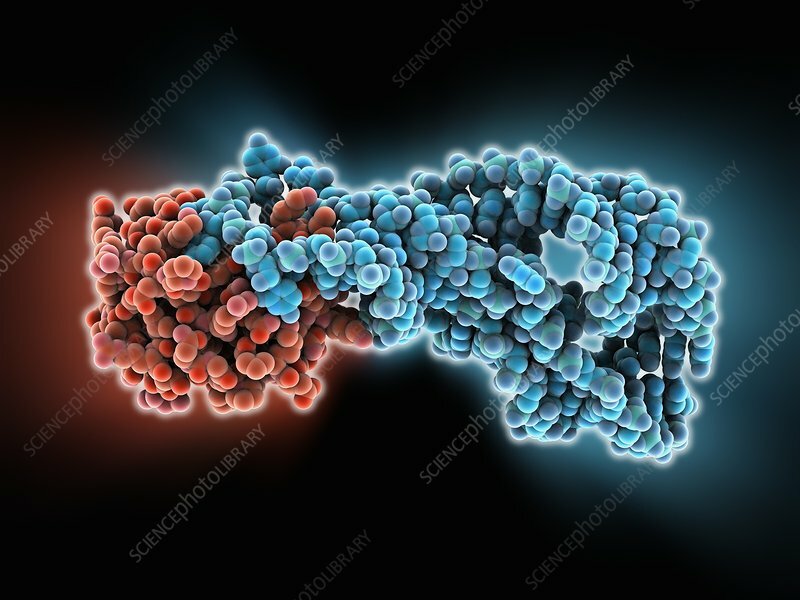 Ribozymes (ribonucleic acid enzymes) are RNA molecules capable of performing specific biochemical reactions, similar to the action of protein enzymes. The genomic and antigenomic RNA of the Hepatitis D virus contain a sequence of 85 nucleotides that acts as a ribozyme. This ribozyme self-cleaves linear viral RNA into monomers, which are then ligated to form the circular RNA of the mature viral particles (virions).